In Apple's Q1 2012 quarterly earnings report, 78% precent of sales were for iPods, iPhones, and iPads. The most important accessory to those devices is a good set of headphones or earbuds. Let's talk about some great options. I love to hear boosted bass. 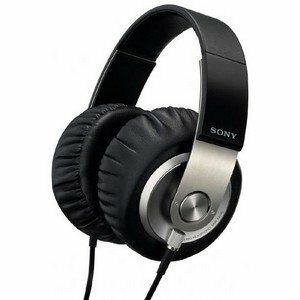 Sony's MDR-XB700 Extra Bass Headphones (50mm driver) have a low frequency response of 3 Hz. That impressive spec along with the large, soft ear cups motivated me to try a pair. The sound quality is amazing and the comfort is tops. I could wear them all day. Your ears are covered so well you experience passive ambient noise suppression. With discounted prices as low as $79, I rate these a great buy. The only downside is the large ear cups look like Princes Leia hair buns -- at least that's what Bet-TAY says. Sony is also famous for "street style neckband" headphones that produce great sound without messing up your coiffure. Being light, they are ideal for working out in the gym or jogging. Plus you can fold them up to pack for a road trip. I've worn out the my old Sony MDR-G72s. I found a newer model in the "Sports and Active Style" section of the Sony website that has even better sound quality. It's the Sony MDR-G75LW. The low end frequency response is 12Hz. Though not as low frequency as the XB700 it beats most similarly priced headphones which are typically 22Hz at the low end. A bonus is the retractable audio cord which eliminates tangles and knots. They sell for as low as $29 on Amazon. As for earbuds or in-ear headsets, I replaced the Apple factory set with the Bose MIE2i mobile headset. A bit pricey at $130, but the sound is superior and the "StayHear" tips keep them from falling out of my ears. They include a built-in mike and remote music control. 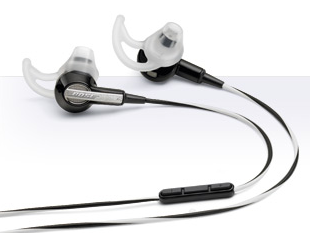 If you have an older Bose earbud set, you can purchase the StayEar tips from Bose. If you are happy with the earbuds and/or headphones you currently own, there's a new app from Sonic Emotion that's supposed to enhance the music listening experience on your iPhone, iPad, and/or iPod Touch. It's called HeadQuake. Download it free from the iTunes store until the end of January 2012. Some iPhone users like the Bluetooth (BT) ear pieces but I want sound in both ears -- so I can hear music in stereo. My search for a good Bluetooth dual ear headset was motivated by my desire to listen to my favorite tunes on the iPhone while pumping iron in the gym. It removes the possibility of snagging an audio cable on the equipment. Plus I can field phone calls without stopping my routine. I've also grown to appreciate the freedom of wireless headsets in the test lab when moving from Mac to Mac. 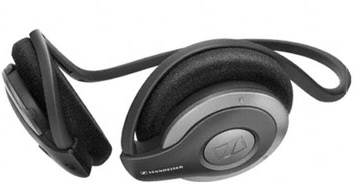 My current favorite is the Sennheiser MM100 Bluetooth stereo headset. The audio purists sneer at Bluetooth headphones for music listening. They say, "Bluetooth is for phone calls, not for for music." It's true that Bluetooth's Sub-Band Codec substantially reduces audio quality and increases audio latency. Latency? Try watching a movie on your iPad while wearing a BT headset. The actors lips are out of sync with their words. Some BT headsets are worse than others. Of course, latency is not an issue if you are just listening to tunes. Speaking of video, when it comes to cable TV watching, I have a different wireless solution which has no latency issues. For several years we have used the Jensen JW-120 900MHz Radio Frequency (RF) 900MHz wireless transmitter/receiver combo in our home. Not only is the sound quality good but it allows you to use your favorite headphones. In other words, I can use the Sony MDR-XB700 or MDR-75LW mentioned above to watch the Superbowl in my Man Cave while Bet-TAY uses her Bose QC-15 headphones with another JW-120 transmitter and receiver in the Woman Cave -- set to a different frequency. I'm not sure why nobody makes this "use your own headphones" RF combos. (The Jensen JW-120 is no longer in production.) What you find are products like the Sennheiser RS120 where the receiver is built into custom headphones that you may or may not like. 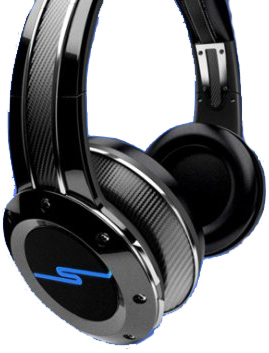 At the recent CES 2012, 50 Cent showed his "Sync" Platinum "studio quality" wireless headphones that utilize Kleer 2.4GHz wireless technology which transmits 16-bit 44KHz stereo audio. For more on Kleer, read the white paper describing "Kleer Advantages Over Bluetooth." Kleer had two disadvantages. Although the 60 foot range is beats Bluetooth's 33 feet, it is only a fraction of the 300 foot range of the newest RF 926MHz wireless headphones. Second, your iPhone and iPad has a built-in Bluetooth transmitter. To use Kleer headphones, you need a Kleer transmitter to be plugged into and dangling from your audio device. Fine for stationary audio system or TV set, but not so convenient for iPhone or iPad. I realize that there are a plethora of headphones and earbuds out there. And what constitutes the best is a personal judgement. But hopefully our stab at this topic will inspire you to go on a quest to find your ultimate "private listening accessory."